Prior to their home opener vs. the Milwaukee Brewers on March 31st 2008, The Chicago Cubs bestowed a unique (and greatly deserved) honor on “Mr. 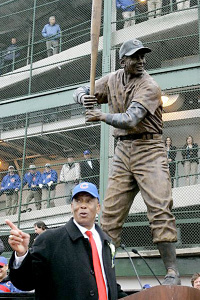 Cub” Ernie Banks by dedicating a beautiful new statue of Ernie in his heyday outside Wrigley Field. The day started when hundreds of fans, Cubs VIPs past and present, celebrities, dignitaries and media from around the globe gathered at the corner of Clark & Addison, to watch Ernie yank away the blue tarp with a look of utter disbelief and humility on his face. After a 19-year career, in which (as he stated in his dedication speech): “…played my entire career in one city, Chicago. one mayor, Richard J. Daley, one owner, P.K. Wrigley, one park, Wrigley Field, and all my home games under one light, God's light..." as well as the ensuing 37 years of serving as the Cubs’ and MLB’s “Ambassador For Baseball” around the globe; the beloved “Mr. Cub” stood in front of the permanent reminder of what he has – and will always mean to the team, fans and city of Chicago. Looking up at the life-size statue, which reads “Let’s Play Two” commemorating his career that was highlighted by two MVP awards, 14 All-Star appearances and a bust in the Hall of Fame, Banks kept asking: "Is that me? Is that me?" There was No. 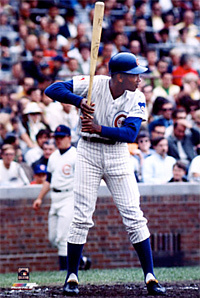 14 in his batting stance, clutching a Louisville Slugger and wearing a grin similar to the one on the face of the real Mr. Cub during the ceremony. The straight-up bat, ready to quick-wrist a pitch into the leftfield bleachers, represents his stance perfectly. And it's Banks' trademark smile that sculptor Lou Cella added that most captures the spirit of Ernie. "It's the best," Banks told reporters. "This is the epitome of American life to be able to have this honor bestowed upon me, think about that. Just me. And when I'm no longer here, I'll still be here. It's amazing. This is amazing to me." In 1982, Banks became the first Cub to have his number retired. This time, he became the second to be immortalized in bronze -- joining the late broadcaster Harry Caray. He also threw out the first pitch and sang "Take Me Out to the Ball Game" during the seventh-inning stretch, despite a sore throat. Besides being honored by the team, the city declared it "Ernie Banks Day." To mark the day, The 500 Home Run Club, LLC (www.500hrc.com) and the Banks family hosted an ultra-exclusive “Celebration For Ernie” event. After the game, the V.I.P. party will continue as you are whisked past the velvet ropes into a private party with Ernie and friends at one of Chicago’s hottest restaurants – Rumba – with proceeds from this ultra-exclusive V.I.P. event benefiting Ernie’s Live Above & Beyond Foundation. "This is a miracle," said an incredulous Banks,” looking up at his statue. "So are you," one of the hundreds of fans lining Clark Street yelled back. Banks' credentials speak for themselves. 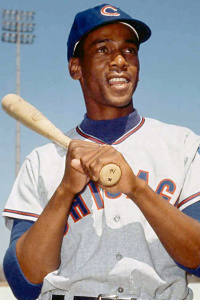 A two-time MVP and 14-time All-Star, Banks hit 512 homers and drove in 1,636 runs while batting .274 in 19 seasons from 1953-71 with the Cubs and uttered that famous phrase -- "Let's play two" -- before a game. Besides putting up Hall of Fame numbers, he also helped clear the way for other black players. "I just wish [the statue] had been done 15 years ago," Hank Aaron said during the ceremony. "Be that as it may, I for one am going to be very proud of the fact that I had the opportunity not only to play baseball with you but to share in your dream. You were the greatest ambassador for baseball, and you still are a great ambassador." The former home run king was one of many dignitaries at the ceremony, along with Rev. Jesse Jackson, Gov. Rod Blagojevich, White Sox great Minnie Minoso and Cubs legends Ferguson Jenkins, Billy Williams and Ron Santo. "Ernie was truly a trailblazer," Williams, a Hall of Famer, said during the ceremony. "He paved the way for so many African-Americans." Santo recalled watching Cubs games on Saturdays when he was a high school senior in Seattle. 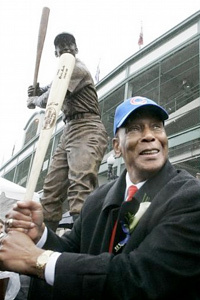 "There was something about Wrigley Field, when I watched the Cubs, and Ernie Banks," he said. "I had 16 major league teams after me, and I picked the Chicago Cubs mainly because of this man right here." During the ceremony, Banks thought about his parents raising a family on $10 a week and how "they were satisfied." He used that word -- satisfied -- often during his speech. "It's a miracle that I made it from there to here," the 77-year-old Banks said. "When I had my number retired, I thought it was the greatest honor because it was the first number ever retired by this franchise. It will still be there 100 years from now, and that's how I feel about this statue. I know it'll be here 100 years from now. It's a miracle. But it is proof that if you find satisfaction in your life, miracles can happen."